TERNOPIL, Ukraine -- The church, a minority faith in largely Orthodox Ukraine, has a long history of guarding the country's identity and independence. 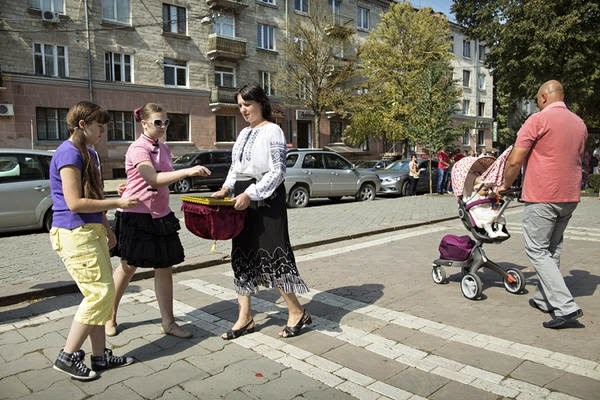 A woman collects money during Sunday morning mass outside the Cathedral of the Immaculate Conception, part of the Ukrainian Greek Catholic Church, in Ternopil, western Ukraine, in September. Now, it is doing so directly, by supplying ammo, medical kits, and armor to soldiers fighting in the east. As the train bringing the wounded soldier home from the front line grinds to a halt, the crowd on the platform bursts into patriotic song. Maj. Ruslan Androsyuk’s three-year-old son jumps into his arms, unsteadying him as he limps from the carriage. Relatives and friends wave balloons and Ukrainian flags, welcoming Major Androsyuk back after a mine ripped through his armored personnel carrier in the Donetsk region, leaving him with a broken leg, fractured ribs, and pierced lungs. “If it wasn’t for his bulletproof vest he wouldn’t have survived,” says his wife Olga, choking back tears. But it wasn't Ukraine's government that supplied Androsyuk his gear. Like hundreds of other soldiers fighting against pro-Russian separatists in eastern Ukraine, his equipment was provided by the Ukrainian Greek Catholic Church (UGCC). After decades of marginalization by both Ukraine's communist and post-Communist regimes and its two dominant Orthodox churches, the UGCC is trying to establish itself as a major pro-European player by supplying government forces fighting in the east. By taking a direct role in the conflict, the UGCC hopes to win followers within a country that is becoming increasingly divided along ethnic and religious lines. The UGCC is a mystery to many outside of Ukraine. Founded in the 16th century, it is the largest of 22 eastern Catholic churches, each in full communion with Rome. "Greek" was added to distinguish it from Ukraine’s tiny community of Roman Catholics. With some 7 million followers, around 15 percent of Ukraine’s population, the UGCC competes with Ukraine’s two, much larger Orthodox Churches – the Moscow and Kiev Patriarchates – for followers, influence, and political clout. The Moscow branch claims 28 million adherents; the Kiev branch around half of that. The UGCC is concentrated in the western regions, especially Lviv, Ivano-Frankivsk, and Ternopil. Western and central Ukraine are home to over 3,000 UGCC parishes, the south and east just 205. The church's centuries-old headquarters recently relocated from Lviv to Kiev, the capital. But while its flock is relatively small, the UGCC prides itself with having shaped Ukraine’s cultural and political identity over the past two hundred years. The national anthem – sung throughout the EuroMaidan protest movement that toppled former President Viktor Yanukovych – was composed by 19th-century priest Mykhailo Verbytsky. Indeed, the church's links to Ukrainian identity spurred Soviet dictator Josef Stalin to dissolve the church in 1946. It continued to hold secret services in cemeteries and forests, while UGCC priests delivered clandestine sermons in Soviet gulags. The UGCC also claims credit for keeping the Ukrainian language alive during Communist times – not a word of Russian is uttered between sanctuary walls. Today the UGCC wants to “assert itself beyond its far western heartland on the back of the growth in Ukrainian self-identity in more central regions of Ukraine,” says Geraldine Fagan, an independent expert on religion in the former Soviet Union and author of "Believing in Russia – Religious Policy after Communism." To do that, she says, the church is tapping into the turmoil caused by the conflict in the east, which has killed over 4,700 people and helped bring the country to the brink of bankruptcy. In a bustling warehouse on the edge of Ternopil, deep in a Catholic heartland where rosary beads abound and the shining domes of cathedrals dot the landscape, UGCC volunteers organize stacks of American and European medical kits. Tourniquets and syringes poke out from the donated boxes. “We are the loudest and most visible in expressing our support for Ukraine’s nationhood,” says Valia Konotopska, the charity’s head. “Our church was the first on Maidan,” she says, referring to the Kiev square where anti-government protests began just over a year ago. The Kiev Patriarchate began to hold services on the square only after the UGCC did, while the Moscow Patriarchate refrained, urging calm. The UGCC's direct role in the conflict is substantial. The powerful UGCC dioceses of Lviv and Ternopil have donated over $200,000 worth of equipment since March to Ukrainian forces, mostly body armor, ammunition, helmets, sleeping bags, stretchers, and medical supplies, official church records show. But the UGCC is not the only church to get involved in the fighting. The Kiev Patriarchate also donates gear – it is yet to provide figures – to government forces. And the Moscow Patriarchate has been linked to supplying the rebels. To some observers, Ukraine’s churches appear to be using the conflict to settle old disputes. While the two Orthodox Churches trade insults, threatening to further splinter, the UGCC has come under repeated fire from the Moscow Patriarchate, accusing it of drumming up anti-Russian sentiment. The UGCC has responded by saying such ire has only brought Catholics, Protestants, and the Kiev Patriarchate closer together. All three see room to expand their influence, says Ms. Fagan. The UGCC's partisan stance could yet backfire. While President Petro Poroshenko and Ukraine's parliament opposes Moscow's policies, pro-Russian politicians could eventually return to power in Kiev, though this prospect is dimmed by the breakaway eastern republics' cleaving of pro-Russian constituencies. Still, were this to happen, UGCC could face increased discrimination against Catholics in Ukraine, as well as a disruption to its plan to expand beyond its traditional western strongholds. At a Sunday service in Ternopil’s eighteenth-century Cathedral of the Immaculate Conception, worshipers overflow onto its gray and white stone plaza. The crowd is full of new parents, and the cry of babies mixes with the melodic hymns being broadcast through loudspeakers. “Over the last year, we’ve seen more and more come to church. More turn to faith in times of crisis,” says visiting chaplain Petro Terletsky, professor in theology at the Ukrainian Catholic University in Lviv. He has just delivered a sermon comparing Jesus’ Parable of the Wicked Tenants – whereby a landlord loses his vineyard’s fruits after lending to an ill-intentioned man – to Russia’s designs on eastern Ukraine. “Our goal is to find a way to connect the east and west of Ukraine,” Professor Terletsky says. "Buying body armor for our troops is part of this." Quote: "Павловский также надеется, что обещанная норма о повышении минимальных зарплат и пенсий, а также индексация на уровень инфляции в бюджете на 2015 год все же будет. «Такое условие было. И с голоса его зачитывали. Социальные стандарты нужно увеличивать, пусть не с 1 февраля 2015-го, а хотя бы по результатам первого полугодия, с 1 июля», - пояснил эксперт." Those complaints are absolutely legitimate and must be addressed by Ukrainian Government and VR.